Adagumo no Saragimaru (徒雲　蛇穴丸) is Adagumo no Yaorochi's younger sibling and a youkai born from Yamata no Orochi's eye. Straightforward and diligent, they secretly look after their elder sibling. They are the Extra stage boss of Earthen Miraculous Sword, as well as a playable character in Reactivate Majestical Imperial. Saragimaru has a straightforward diligent personality, and because of it, they're often manipulated by those around them, such as Kuroji. For this reason, they often fail at whatever they are doing, but they particularly excel at instantaneous speed and concentration power. As pointed out by Shion, they have a self-sacrificing personality, fitting for a subordinate. In comparison to Yaorochi, Saragimaru has the fewest number of tails for an orochi, and it's a clear sign of Saragimaru's power. They are devoted to serving their older sibling Yaorochi. Saragimaru loves them very much because they're their only living relative, but due to Tasouken's curse (to sever relationships), Yaorochi doesn't care about them. Saragimaru even threatens to kill the heroes in Earthen Miraculous Sword for stopping the ritual that'd restore the Tasouken and thus interfering with Yaorochi's happiness. Perhaps due to being isolated for so long, Saragimaru is a loner by nature and chooses not to socialize with humans or youkai. When they do associate with someone, they act rather awkwardly. Like their sibling, they look down on humans. Nevertheless, to those whom they're acquainted with, Saragimaru speaks bluntly and has a snarky personality. They're presented as the most no-nonsense character out of all the Len'en Project, and having lived for over centuries, they don't mince words when noting they have to deal with the equivalent of kids from their perspective. Saragimaru is able to control clouds and create cloudy weather. In the Extra Stage of Earthen Miraculous Sword, they create clouds around Mugenri in order to lure the heroes into a deadly trap, though their plan is eventually foiled. The leader of a powerful clan (implied to be Yamata no Orochi) was betrayed and killed by other enemy clans and his body was dispersed in several fragments. Saragimaru was born from his eye, and because of it, they're very knowledgeable. Yaorochi and their seven siblings decided to get revenge on Orochi's murderers, but most of them died before achieving their goal. Yaorochi was very cold and distant to their younger siblings and for some reason they never got along particularly well with the youngest, Saragimaru. It eventually escalated to violence which culminated with Yaorochi cutting Saragimaru down. Given the nature of the Tasouken, their bond shattered and they distanced. Shortly, Yaorochi abandoned them in order to look for the sword. They searched for it for several years and was very disappointed when they found it all rusted. Saragimaru, who had silently looked after Yaorochi all those years, requested Sukune Katano to make a clay sword for Yaorochi, but afraid of their sibling's rejection, they never went to pick it. 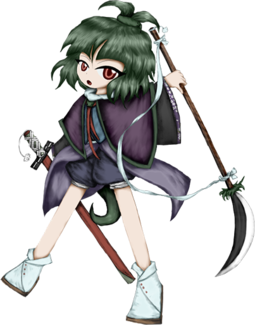 Their character might be a homage to Youmu Konpaku . Both are young and inexperienced, with a straightforward and diligent personality. They're also often mistreated by others and use dual wielding weapons. Additionally, they also have an eccentric master whom they have trouble understanding. Their full name is Adagumo no Saragimaru (徒雲　蛇穴丸). Their given name Saragimaru (蛇穴丸) is spelled with the kanji for "snake", "hole", and "circle". The maru (circle) suffix was historically added to names of swords and sailing ships. Yabusame Houlen can't remember this and calls them "Salami" (サラミ, sarami). Their surname, Adagumo (徒雲), means "vanishing cloud". It refers to the concept of ephemerality, giving the impression of a cloud that disappears as soon as you reach out to touch it. The hiragana character no (の) used here indicates a "belonging", thus the English equivalent of their name would be "Saragimaru of the Adagumo". In ancient Japan times, it was common for aristocrats with a clan's name to have no between their clan's name and first name. 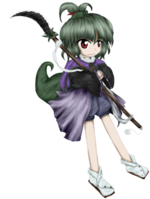 Saragimaru has red eyes and short green hair tied in a short side ponytail. They dress in black and green clothing with a green capelet. As an orochi, they have one tail. It's revealed that they soon regretted requesting the Tasouken, as they knew it was dangerous for it to be restored. However the essence of the Tasouken was too strong for the clay vessel and during Adagumo no Yaorochi's fight against the three heroes, it attacked them on its own, only to be defeated. After Yaorochi is defeated, the clouds dissipate. However, a few days later, the cloudy weather returns. Drunkenly, the heroes go to investigate and they found that this time the culprit is Yaorochi's younger sibling, Saragimaru. They wanted revenge for the sabotaging of the Tasouken's ritual and thus ruining of Yaorochi's happiness, so they lured the heroes into a trap to murder them. They are defeated and the heroes attempt to befriend them by inviting Saragimaru to their sake party. Saragimaru is once again stalking Yaorochi at the Senri Shrine. Kuroji catches them in the act and blackmails them into cooperation. The orochi agrees, and they begrudgingly form an alliance. Also, Saragimaru decided that they won't tell Yaorochi of their parentage, preferring to protect them from the shadows. On the way, the group keeps bumping into weird youkai, while Kuroji attacking them in order to steal their valuable things, much to Saragimaru's displeasure. After dealing with the person who the signboard was directed to, Fujiwara no Iyozane, they reveal that they're working to resurrect someone important and will receive something valuable from it. Kuroji believes it's money, only to attack them in frustration when Iyozane reveals they're penniless and they'll actually gain a position as a chief advisor. On the Frost Cavern, they bump into Yabusame and Tsubakura, who are curious about their partnership. Kuroji wants to prove once again that they're stronger than Tsubakura and settles on a fight. Angry at the person who wrote the signboard for making them waste their time, Kuroji goes with the orochi to ruin said ritual. They find Taira no Fumikado, who was trying to collect spirits for their resurrection ceremony, since they want to resucitate the vengeful spirit Taira no Masakado and store him in their homunculus body. After defeating them, they find out that all the spirits are attracted to a certain location. Finally, they end up in the Withered Grove, where they find the chimera soul Shion, who is the avatar of the soul-eater flower Harujion and was absorbing spirits, causing a long winter. Saragimaru senses that Shion's spirit is composed of evil spirits and is unsure about fighting someone so dangerous, but obeys Kuroji when the latter decides to steal and sell the flower. Shion fights them in order to protect the Harujion. In the end, Kuroji and Saragimaru arrive at the Senri Shrine, bringing Shion with them. Shion indicated that they were attracted by the essence of the shrine. Kuroji wants to sell the remaining spirits to collect money while Saragimaru is worried about the amoral things Kuroji does to get profit and decides to keep an eye on them. It's revealed that the spirits came to Mugenri because of a hole in the Mugenri Barrier that separates the land from the Outside World. The hole was caused by Lumen, during the Clouds Incident and Tenkai Zuifeng was tasked to repair the hole, but is taking too long. Saragimaru is revealed to know Tenkai, but being hostile to most humans, they're not on good terms with them. On the way back home, they are ambushed by Sese Kitsugai, a youkai they had defeated at the beginning of the story. Sese absorbs the spirits the heroes had been recollecting, much to Kuroji's chagrin, who wanted to sell them. After Sese is defeated, the spirits leave Sese's body and Kuroji orders Saragimaru to retrieve them. Apparently now Saragimaru works for the Shitodo household as a servant and lives with them. Worried that Yaorochi is receiving constant invitations from both sides of the war to be their ally, Saragimaru escapes from the Shitodo house to protect Yaorochi from the shadows as usual. 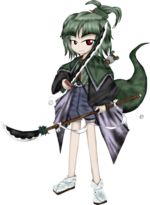 Saragimaru is devoted to serve and protect their eldest sibling Adagumo no Yaorochi. In the past, they had a fickle relationship and they distanced when Yaorochi slashed them. They love and respects their older sibling very much (calling them "Yaorochi-sama") and wishes to be close with them, but Yaorochi doesn't notice or care about them anymore, too obsessed with the Tasouken to notice them. In order to make them happy and to stop Yaorochi's confinement from the world, Saragimaru requested Sukune Katano to make a clay sword that resembled the Tasouken, despite knowing it was dangerous. Even if they're aware that Yaorochi cares very little about other people, much less them, Saragimaru doesn't mind and they're happy as long as they can continue passively protecting their older sibling. Since Reactivate Majestical Imperial, Saragimaru works as Kuroji's unwilling servant, something the orochi is not happy about. Saragimaru considers Kuroji a contradictory and vicious scoundrel who gets away with everything. Kuroji doesn't mind to such things, but when angered enough, they will not hesitate to remind Saragimaru of their blackmail. Kuroji likes Saragimaru because of their strength and straightforward down-to-earth personality. However, Kuroji is willing to blackmail the orochi into cooperation or sell their identity. The two are generally on "friendly" terms, and it's suggested that Kuroji cares about them in their own way, such as consoling them when the orochi is feeling cold or helping them to hide from Yaorochi. Also, Kuroji has stated many times that Saragimaru reminds them of Aoji. Since Saragimaru became Kuroji's unwilling servant, they live at the Shitodo's house. Hooaka does not have respect for Saragimaru and treats them like a slave, while Aoji is terrified of them. Saragimaru dislikes them because they're humans and related to Kuroji. It is known the Saragimaru and Tenkai knew each other before the events of Reactivate Majestical Imperial. They seem to be know each other and Tenkai knew of Saragimaru's plans to restore the Tasouken. However, Saragimaru despises humans and Tenkai is no exception to them. ↑ A reference to the original name of Kusanagi, Ame no murakumo no tsurugi, or "Sword of the Gathering Clouds of Heaven"
↑ "Sacred Treasure" refers to the Imperial Regalia of Japan. The card references the Yata no Kagami. ↑ This card references the Yasakani no Magatama. ↑ This card references the Kusanagi. It also contrasts with Tasouken's ability, "Ability to sever relations". ↑ The Divine Grandson, or Ninigi-no-Mikoto is the grandson of the Chief God Amaterasu. ↑ Saragimaru's Flash Bomb and eighth card in Earthen Miraculous Sword. ↑ Hihayahi is one of the gods born from the blood of the fire god Kagutsuchi after he is killed by his father Izanagi. ↑ Saragimaru's bomb and penultimate card from Earthen Miraculous Sword. ↑ Adagumo, or "Vanishing Cloud", is Saragimaru's family name. It refers to the concept of ephemerality, giving the impression of a cloud that disappears as soon as you reach out to touch it. It must be an amazing feat for something so transient to never disappear. ↑ A variation on Saragimaru's Flash Bomb and eighth card in Earthen Miraculous Sword. ↑ A janome (ʘ) is a circular symbol symbolizing a snake's eye. ↑ The "Turning Swallow Cut" (燕返し) is a sword technique famously used by samurai Sasaki Kojirō. ↑ The kanji mu (鵐, "bunting") is part of Kuroji's name. Saragimaru's musical theme, "Mono Eye ~ Ironic FATE", may also read as "Mono Ai". According to JynX, it could refer to their "single eye", or maybe it's more like their one-sided love towards Adagumo no Yaorochi. They seem to have low stamina, getting tired for the smallest things during Reactivate Majestical Imperial. According to Jynx, Saragimaru is the most mature and the only one with common sense in Mugenri. Yaorochi's and Saragimaru's color schemes are inverted since Reactivate Majestical Imperial. This page was last edited on 13 November 2018, at 09:49.